8. Verifies whether specific attributes are in, or not in, a specific product or service. 9. Identifies weaknesses in processes and improves them. 1. Which of these is NOT part of the Cost of Quality? 2. The term “fit for use” refers to whose view of quality? 3. Which of these is a challenge/obstacle to implementing testing in an organization? 5. What are the three main categories defects can fall into? 6. Which of these is NOT an important part of a Test Strategy? 7. Which of these are good ways to raise management’s awareness of the importance of testing? 9. Which is a more effective approach to risk mitigation? 10. Establishing a testing policy should include four main criteria. A definition of testing, the testing system, evaluation methods, and ________? 11. Which of these is the most effective method for establishing a testing policy? 12. During what phase of the project should you START thinking about Testing Scenarios? 13. What is the appropriate timing for Static, Structural tests? 14. Test coverage tools are useful starting in which phase? 16. ________ means that the data entered, processed, and output by the application is accurate and complete. 18. _____________ can substantiate the processing that has occurred and allow analysts to reconstruct what happened at any point in a transaction. 22. Audits to ensure that the system is designed in accordance with organization strategy, policies, procedures, and standards are designed to test which quality factor? 24. If it is difficult to locate and fix errors in a program, that program is missing which quality factor? 25. The quality factor “ease of use” is best measured by doing what type of testing? 29. Which way(s) can lower the cost of testing without reducing it’s effectiveness? 30. ________ ensures that we designed and built the right system, while _________ ensures that the system works as designed. 33. Which of these are considerations when developing testing methodologies? 40. Which is a benefit of having a user committee develop the company’s test policy? 41. Which of these types of reviews is NOT an effective phase containment mechanism? 42. Which of these was not a Quality professional? 43. The successful implementation of a quality improvement program will have what long-term effect on productivity? 44. Which of these are some of Deming’s 7 Deadly Management Diseases? 48. Which is an important source of data for Continuous Process Improvement? 49. Who should NOT participate in testing? 53. Of the four options listed below, which is able to detect an infeasible path? 55. Which catches errors earlier, verification or validation? 57. Who should not be allowed to participate in and contribute to the improvement of processes? 58. Improving weaknesses in a process you just piloted is an example of which piece of the Shewhart cycle? 1. Which document contains both technical and non-technical instructions to users during setup? 2. Which is true of Security and Internal Control-related specs? 7. 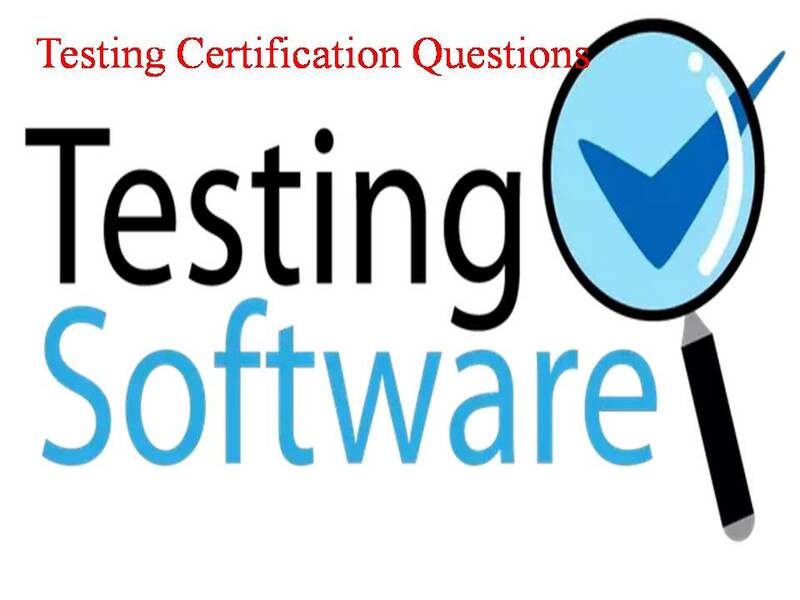 _________ Tests tend to uncover errors that occur during coding, while _______ tests tend to uncover errors that occur in implementing requirements or design specs. 8. In the ___________, specific types of sensitive data are identiied, and the degree and nature of the sensitivity is outlined. 9. The __________ identifies internal control and security vulnerabilities, the nature and magnitude of associated threats, potential forloss, and recommended safeguards. This should be a living document that is updated during each phase. 10. Which item(s) should be present in a VV&amp;T plan? 12. Which is NOT true of the User Manual? 13. Which of these are examples of structural system testing techniques? a) Provides stakeholders with adequate cost and benefit information. b) Might be a separate doc, or might be part of the feasibility study. a) Records essential information such as mission need, milestones, threshholds, issues and risks, etc. b) is the master document related tot he whole SDLC. 19. The ideal software testing process involves testing artifacts produced during development, such as requirements documents and design specifications. 1. Which is true of Suggestion Day? 2. Which of these is a “DON’T” when giving criticism? 3. Which is not a good way to combat Groupthink? 4. When delivering an Oral System Proposal, you should emphasise your enthusiasm to do the project, but not emphasize the expertise of yourself and your staff. 7. The content of a System Proposal should include the people costs and the effects on other systems, as well as the standard cost benefit analysis. 8. It is acceptable to close the System Proposal without discussing everything on the agenda if the audience shows signs that they will approve the project. 9. Task forces should tackle more than one issue at a time. 11. Which one of these is NOT one of the three components of receiving information? 14. If a person says “Sure, we will make the deadline” but has a smirk on their face, which two information channels are out of sync, and which should you pay more attention to? 15. When trying to piece together facts from several different people, _________ listening is important. 16. Which type of listening is typically not needed during a verbal walkthrough (Unless Phyllis is on the call)? 17. Which of these is NOT a good way to portray a successful image? 18. It is a good idea to give management regular updates on the current status of task force activities. 20. Which of these is NOT an important part of initiating an action program for conflict resolution? a) it is usually BAD and leads to bad decisions. 22. In order to get the “whole” message with minimal distortion, _______ listening is necessary. 1. ________ and ________ are used within individual workbenches to produce the right output products. 4. Whose responsibility is it to set policies? 5. Which of these is typically NOT the role of management during tool selection? 7. The standards program is driven by management policies, but workers should develop their own standards and procedures. 14. A _______ is the emasure used to evaluate products and identify nonconformance. 15. The _______ should accept topics for standards, but the _________ should develop individual technical standards. 19. When implementing a new tool, it is a good idea to assign one person full time to the tool’s deployment. 20. When doing an informal tool acquisition, it is still necessary to write an RFP. 2. Before performing volume testing, it is important to challenge each input and output data element, to determine potential limitations, and then document those limitations. 3. Before selecting which conditions you are going to include in your test suite, you should rank the test conditions according to risk. 5. Assuming you could reach 100% of any of the coverage types below, which one would leave the MOST potential for unexecuted code (and therefore, undiscovered errors)? 6. When evaluating whether a test suite is complete (eg, doing a peer review or inspection), Which of the following should NOT be considered? 7. When performing volume testing, a small percentage of invalid data should be used. 9. Which of these is not a good use of a code coverage analysis? 7. When reporting a defect, which of these should be included? 9. What is a good way to tell it’s time to stop system testing? 10. Which of these is not a typical way to test for the Reliability test factor? 11. When documenting the actual result of a test in a bug log, it is necessary to record the specific inputs and outputs used. 12. Which of these is NOT a significant concern surrounding the test phase? 13. Trying to delete or overwrite controlled files, to make sure the files cannot be deleted or overwritten, are examples of what kind of test? 4. Which of the following are ways to use the defect log to drive process improvement? 5. The minimum requirements for a defect management process include all but which of these? 6. Reducing the impact of a risk, should it occur, is an effective way to minimize risk. 7. Who should be involved in prioritizing fixes for valid defects found during system testing? 8. Which of the following techniques is not a common way to minimize expected risks? 9. Which is cheaper, preventing defects or fixing them? b) not counting defects caught and fixed before your phase. 11. Which of these is not a “best practice” for defect managment? 12. Which of these is not a valid purpose for reporting defects? 15. Which of these refers to the “cost” of the risk? 4. Which of these is NOT an example of stress testing? c) Inducing a failure on one of the systems such that the program terminates. b) estimate the number of bugs left in the code by measuring how many “bait” c) errors have not been found. 6. _______ attempts to decide what constitutes a sufficient set of paths to test. 8. Which type of testing gives you the best coverage? 12. Which of these is an objective of Operations testing? 13. Cost benefits analysis is particularly important during _________ testing, otherwise large amounts of effort can be expended with minimal payback. 15. Which of these are all types of structural testing? 16. Which of these is a main objective of Security Testing? b) Determining that system test data and test conditions remain current. 18. Which of these are examples of Requirements testing? 26. When is it appropriate to use intersystem testing? 28. Which of the following can be used as test oracles? 30. Functional analysis is a ______ testing technique, whereas functional testing is a _________ testing technique.